Happy Friday Sunday! I’m especially happy because Friday was my birthday. 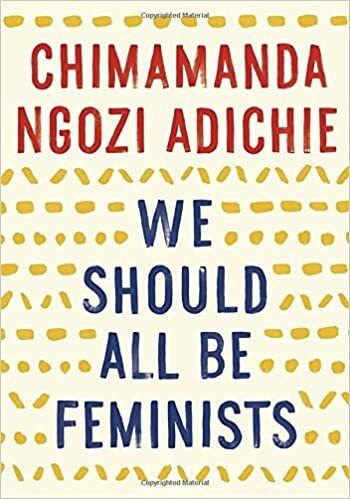 Now that I have publically and shamelessly wished myself a happy birthday, let me get on with the review and Friday 56 of We Should All Be Feminists by Chimamanda Ngozi Adichie. Adichie is, dare I say it, my she-ro. I was on the wait list for this essay, which is a modified version of the TedxEuston Talk she did in 2012. (I attached the talk if you’re interested) I had already watched the Talk, prior to reading We Should All Be Feminists, and I must say that this short book does and should bear reading by women and men, alike. I don’t know of any woman who has not experienced at least one of the things Adichie relates. You know, you’re a feminist. a nice, well-meaning man. . .
since feminists are women who are unhappy because they cannot find husbands. I chuckled when I read that because I know my share of unhappy women that have husbands. And speaking strictly for myself as a single woman and a feminist, I am indeed quite happy, and no I don’t hate men. I tend to dislike men and women equally based on how deplorable of a human being they are. Anyway, I related to several of the points. But one incident Adichie related hit particularly hard as it was one that happened recently. She was at a restaurant with a male friend, and ignored by the waiter. My boyfriend and I had gone to a winery. I am much more knowledgeable about wine than he, but the sommelier kept addressing my boyfriend, even when I asked a question the answer was directed to my boyfriend. After a few times of being blatantly ignored, I turned to my boyfriend while the sommelier was in mid sentence and told him I was ready to go. Needless to say the sommelier was a shocked by my blatant impudence. But oh well. So, what is a feminism? According to ForWomen.org feminism in a nut shell is ”the social, economic and political equality of ALL genders.” This includes seeking to establish educational and professional opportunities for women that are equal to such opportunities for men. Now, please tell me what so hard about that? But by far the worst thing we do to males – by making them feel they have to be hard – is that we leave them with very fragile egos. The harder s man feels compelled to be, the weaker his ego is. Because the book is so short it is virtually impossible to go into many details. It is a wonderful introduction into the world of feminism and how we need to change the way in which we raise our boys and our girls. This short essay gives some pretty solid advice as to how we can and must do better in order to raise boys that don’t have fragile egos and how we can raise confident girls that don’t make themselves smaller. ← What Your Reading Style Says About You. Take the Quiz!! PS Happy belated birthday Erica! Sounds like an amazing read!!! Adding to my GR! Have a great week ahead! ive read snatches of this which have made me interested to read more. And I can so relate to your experience in the winery….